JANUARY 1 — It was a particularly eventful year for chess in 2014 and so as we begin 2015, it’s a good time to recap the major events that largely shaped the year that was. The obvious start is the watershed FIDE Elections which dominated the headlines for much of the year. The legendary 13th World Chess Champion Garry Kasparov challenged the long-serving incumbent Kirsan Ilyumzhinov who had held the position for what most felt was a much too long 18 years. But Ilyumzhinov retained his position with a comprehensive win as Kasparov’s well-funded American-style campaign failed spectacularly. A perhaps naive Kasparov was up against three major factors in play to which he had no answer: firstly, the mass of vested interests within FIDE aligning to preserve the status quo against the perceived threat of replacement; secondly, the Russian state apparently throwing its full and considerable political resources behind its former Kalmykia republic head; and thirdly, a chess world showing a huge disjoint between officials and players and which as a consequence completely failed to take any principled positions. It was some time coming but in 2014 China announced its arrival on the world stage in no uncertain terms, having already for several years before all but abandoned its pursuit of Asian chess titles to focus on competing globally to take on the best on equal terms. This strategy has clearly now paid off with their men’s team winning the World Chess Olympiad for the first time and soon after Liu Shanglei became World Junior Champion ahead of their more favoured 15-year-old prodigy Wei Yi. 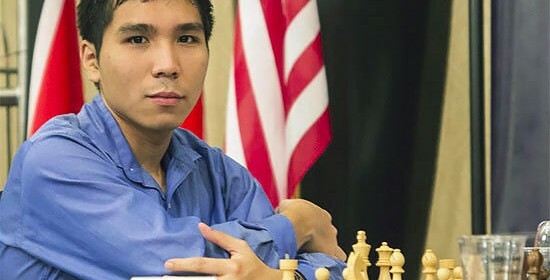 In doing so, he successfully followed in the footsteps of his countryman Yu Yangyi who had already made the step up by not only helping anchor the China team to victory at the Olympiad but also through winning major events such as the Qatar Open by beating the likes of Top 10 players Vladimir Kramnik and Anish Giri. Add to that China has in the last decade been a major force in women’s chess with just-turned-20 Hou Yifan an especially brilliant world champion well on the way to becoming the strongest female player in history. The other really big news besides the FIDE elections was of course the “return” World Chess Championship Match between Magnus Carlsen and Viswanathan Anand, an event that came perhaps much too quickly for the new champion as it was held just a year after he had taken the title by comprehensively beating the older Indian in his hometown of Chennai. Anand had surprised the world and himself by easily winning the qualifying cycle to get the chance to take back his title and he came much better mentally prepared for the match held in Sochi. Sochi was wonderfully organised as could be expected from Russia who treats chess like part of its heritage but it was a very controversial decision as it seemed no one really wanted to host the match and not only was it difficult politically for Norwegian Carlsen to play given the EU sanctions against Russia but the prize fund had been cut by half and in fact did not materialise till well after the match was underway! It was not as easy as before but Carlsen again showed he was very much the stronger player and won by exactly the score he predicted. The other truly world class chess power in Asia is India; it has been the dominant force in all international youth events for many years now and they would have found it very sweet to emerge as the winner of the just concluded World Youth U-16 Olympiad in Hungary. Because this year’s move to have it held in Europe all but ensured that not only a significant number of teams took part but that much talent was on display this time around with numerous young grandmasters playing. Closer to home it was all about Filipino Wesley So, a young man who had very early shown he had the talent to compete with the very best in the world. So had in the last two years been a student at Webster University under a chess scholarship, becoming a mainstay of their all-conquering collegiate team coached by Susan Polgar who had assembled some of the best young talent in the world there and benefitted from being in St Louis, the capital of USA chess. Everyone knows about Polgar and her husband Paul Truong and their siege mentality approach to ensuring success. In his time in the USA and with his family having already migrated to Canada several years before, So benefited not only by having a chess family and the opportunity to work systematically on his game with other talented young players but also to play numerous events, all of which helped catapult a very talented high 2600 player well into 2700 and into the Top 10 world rankings. What was controversial was that So was convinced along the way his future was better served representing the USA instead of the Philippines and now he has gone one step further by deciding to quit college to focus on becoming World Champion. Certainly there were many lessons to be learnt from 2014, of course from the successes of the many who did so spectacularly well, but very discomforting is that there has been also a frightening number of indications that chess as it is organised today internationally by FIDE is not only in serious decline but completely in crisis. Looking at how chess is organised, at its very core, is firstly a failing world championship cycle; the introduction of additional qualifying rounds through the World Cup and Grand Prix, even the abbreviated Candidates tournament and actual World Championship Match itself with few sponsors outside of what Russia and its satellite states can support. This means the likes of oil rich states like UAE, Qatar and even Iran are constantly being asked to chip in. The good news is that the long-standing traditional Open Championships and also the private invitational tournaments largely remain in place even if some have scaled back in recent years. However, it is less rosy when looking at the remnants of the original FIDE tournaments at continental level; the zonal championships (the original qualifying for the world championship) and less important and poorly attended senior, amateur and schools championships are parcelled out or imposed on smaller federations. On the flip side on the world stage and sometimes at some regionals, the big youth events are clearly a booming business! This state of affairs has forced the current FIDE to survive by increasing and creating fees often for services that they should be providing for free to their members and this essentially ensures most national chess federations are without real help and have all but lost the ability to develop the game in their own countries. Unlike other sports, there are no real events or series limited to professionals, unlike say in motorsports where there is Formula One at the pinnacle. Of course there have been attempts to have Grand Slam type tournaments with the alternative round robin (all play all) system, but again it is really up to organisers and their sponsors to decide. In fact there is no amateur status in chess as practically anyone can play in the open tournaments that remain the main form of chess activity throughout the world. There are also various official team events and while these offer a semblance of representation beyond the individual, it remains one-off with players largely remaining free agents dependent on prize money, tournament stipends and any sponsorship they can get personally. Chess will never be a sport but a game unless FIDE is able to distinguish between professionals and amateurs and to also overhaul the rating system and rationalise its use for qualifying, perhaps with a points system introduced as in tennis and golf, and in doing so to equitably sort players in categories and the events they can play accordingly. (One other idea is the creation of sports teams and leagues where players have to be members to play professionally). Without this, there is no hope to successfully engage media on a global and ongoing basis and to enjoy the resulting benefits enjoyed by all sports, not only the major but even those niche ones that have successfully found their audience. There are national chess federations with both money and membership but also too many with nothing more really than just a vote. Of course the majority falls in between. Besides the underlying need for FIDE to serve and stop just taking, this one vote one country without real obligations needs to be stopped. Perhaps it should be in three tiers — professional, amateur and provisional. Federations then having either professional and amateur status should enjoy full and equal voting rights but not the many who need to be downgraded to provisional and perhaps those enjoying professional status being part of an executive shaping policy to elevate the professional game. For chess to progress, to flourish, significant changes like what I am proposing needs to be adopted as it has reached a point where failure to do so is condemning the game to a continued downward spiral from which the efforts of independent chess lovers can no longer slow down, let alone stop. Chess has its own and many unique and marketable value propositions but these are not properly monetized even from within and this is because the current global chess leadership who have served for decades with nothing to show is clearly bankrupt of ideas while lacking even the most basic competencies required to manage an international sports organisation let alone grow the game globally. It is also certainly unable to engage or develop media in ways that can attract advertisers. And worst, this failure has filtered down to encourage, perhaps even reward, mediocrity at all levels of national chess federations. Good and interesting summary, I completely agree with your thoughts on League chess. A Champions League should be the highlight of the season. In Norway, we have a league that noone takes any interest in, and some team fill their squad with international players that has no connection to the club whatsoever. Needless to say, media pays absolutely no attention.